Along with being a musician and artist, Kandinsky was also a scholar. He graduated from the University of Moscow in 1886 with highest honors and took a position on the Moscow Faulty of Law while doing his art on the side. He chose to abandon his law career and move to Munich to devote himself to art full-time after seeing an exhibition of French Impressionists. Claude Monet’s Haystacks at Giverny specifically inspired him to leave his law career. It’s been said that behind every successful man is a woman who inspired and supported him. Well, for Kandinsky, it just so happened to be his beautiful cousin on his father’s side. Although it may seem odd today, it wasn’t such an odd thing back then. In 1892, Kandinsky married his cousin Anna Chimyankina and was with her for 10 years. She was one of his muses and inspired him from the moment they met. Although the marriage ended in divorce, they still stayed in touch – they were family, after all! Before he was divorced from his cousin, the beautiful Gabriele Munter appeared in one of Kandinsky’s art classes and he instantly was taken by her. Munter once wrote in one of her diaries that Kandinsky took her “as a person having a conscious endeavor.” She was quite enamored by him and she won him over with her confidence and composure – two things he lacked himself. Their friendship eventually grew into love even though Kandinsky was still married. They got engaged (yes, while he was still married!) but kept their love a secret. 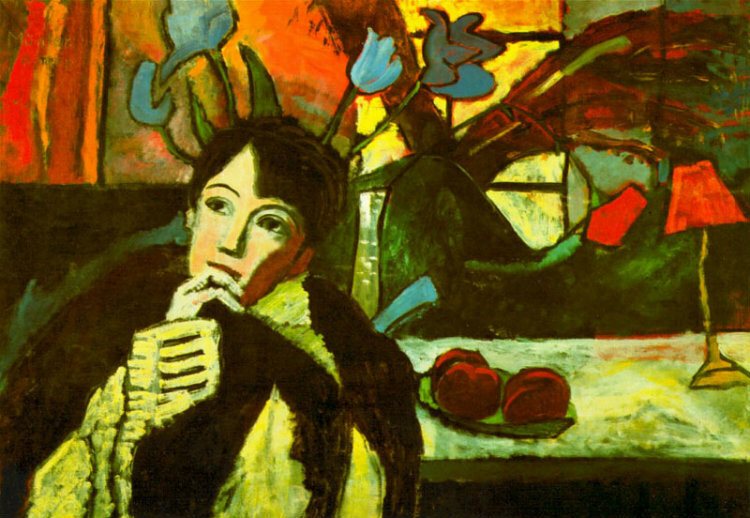 He created two portraits of Gabriele Munter – one in 1903 and another in 1905. The first is a portrait of her at an easel, the second is a much more solemn, serious portrait that captures the emotions of their furtive love. Finally, in 1911 he officially divorced from Anna and in the spring of 1916 he promised to do the marriage papers with Munter. In the winter of 1917 he married, but not to Munter! Instead it was to Nina Andreevskaya, a much younger bride (she was 17, he was 50!) who he had only known for 6 months prior to their marriage. Kandinsky didn’t tell Munter about his marriage and ignored the letters she sent trying to reach him. Born in Moscow on December 16, 1866, Kandinsky lived, studied and worked in Russia until the early 1920s. He then moved to Germany where he devoted his life to art and taught at the Bauhaus school of art and architecture from 1922 to 1933. Unfortunately, the Nazis shut the school down and he left Germany to live in France where he spent the rest of his life. Although Russian-born he wanted a German citizenship and later when he moved to France, he applied for French citizenship. Living in a communist country and being anti-communist doesn’t usually go very well. Because Kandinsky’s views differed so much from the government, he left Russia in 1921. His art was immediately banned from Russian museums and to this day very few remain. Many of his paintings, however, are still in museums in Germany. Kandinsky’s “Studie fur Improvisation 8” sold for $20 million at a NYC auction in 2012. The piece sold by Switzerland’s Volkart Foundation, set an auction record for the Russian artist. Many of his other pieces go for anywhere between $1 million and $15 million. His most famous painting, Kandinsky referred to Composition IV as a representation of the art of the future. From the average person’s point of view it simply looks like streaks of colors and random lines, however, each and every stroke and color has a story to tell. The red spots on the piece in the front and the thick black lines represent three Cossacks preparing to go into battle. The left of the painting depicts ensuing war, the right is peace. The goal of the painting was to depict an apocalyptic battle ultimately ending in eternal peace. While it is a work of art, it is a musical composition as well. 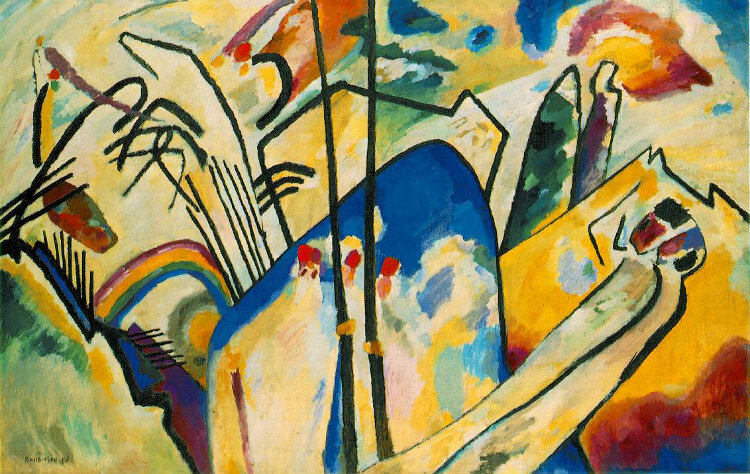 Kandinsky had Synaesthete, which is a neurological condition in which a person associates certain colors with notes or sounds. 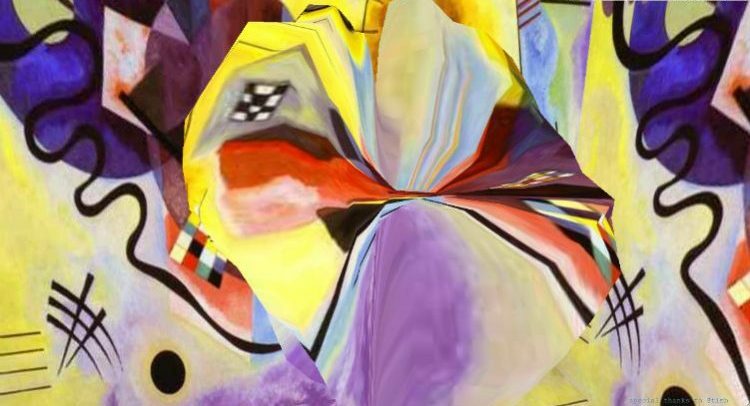 In other words, to Kandinsky, Composition IV had a tune that went with it. 8. Died in France on December 13, 1944 from cerebrovascular disease. Somewhat common, this type of disease affects the blood vessels in the brain and can cause slurred speech, muscle weakness and strokes. Sadly, because of it, during his final years, Kandinsky lived a relatively secluded life and was unable to paint or play music because of his disease. Some say he was extremely depressed and heartbroken during his final days. 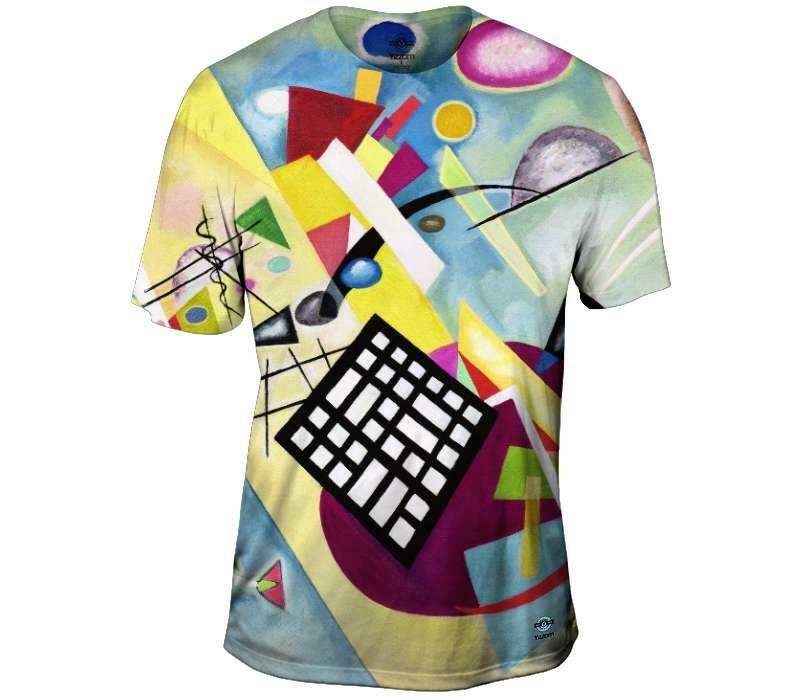 If you’re like us and can’t get enough of the fascinating Wassily Kandinsky, then you’ll love our new collection devoted to the Russian painter himself. 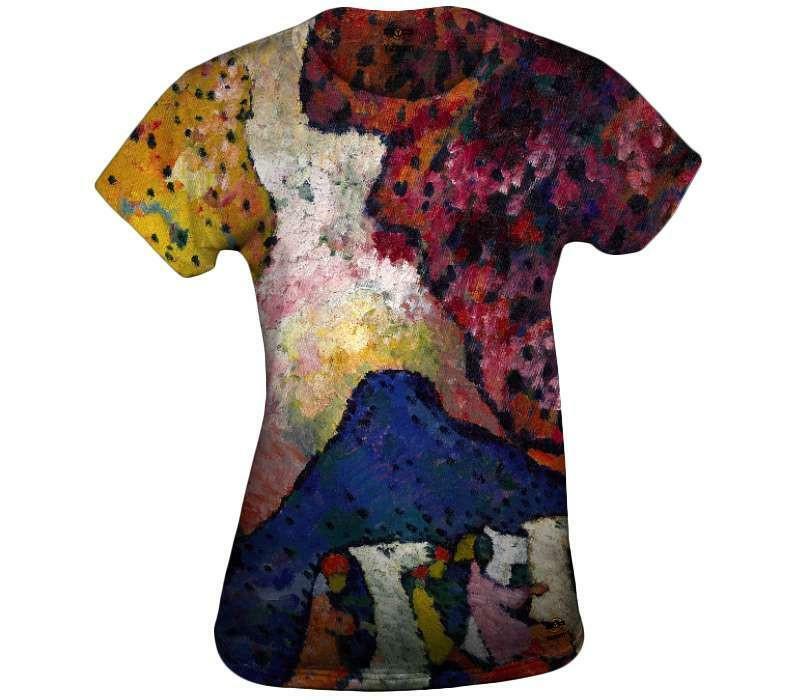 These abstract prints are as colorful as they are comfortable and they look great with just about everything. They also make great gifts for people you love like girlfriends and cousins. Spearheading the abstract movement, Kandinsky believed that colors have inherent qualities and movements. These colors, he felt, could be used in the lines and shapes to express emotions and feelings outside of representational art. Black Grid, originally an oil painting created in 1922, is now one of our most popular prints available for you to wear as a t-shirt with your favorite pair of jeans. 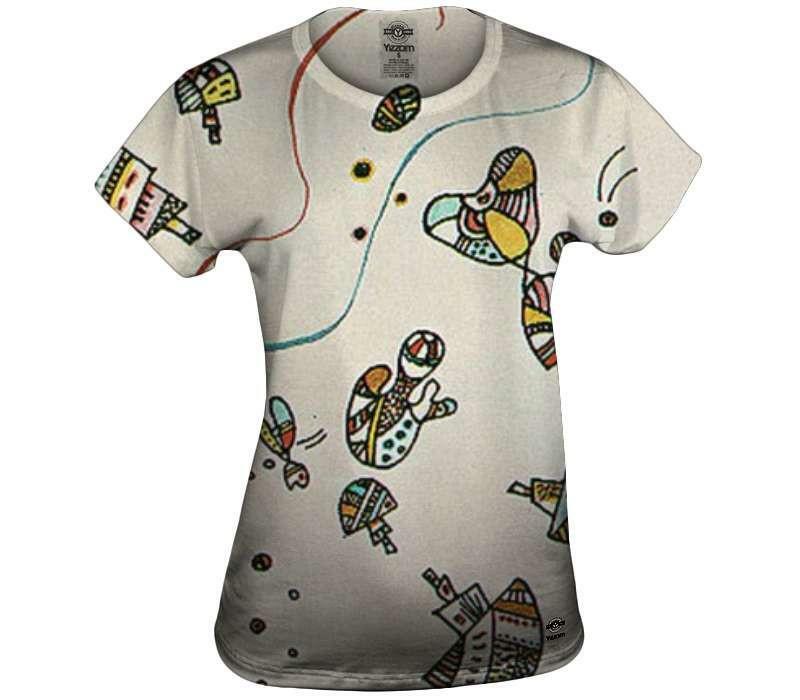 Also available in a top for women. With the use of a horse and rider motif, in this popular painting Kandinsky symbolized his crusade against conventional aesthetic values and his dream of a more spiritual future via the transformative powers of art. 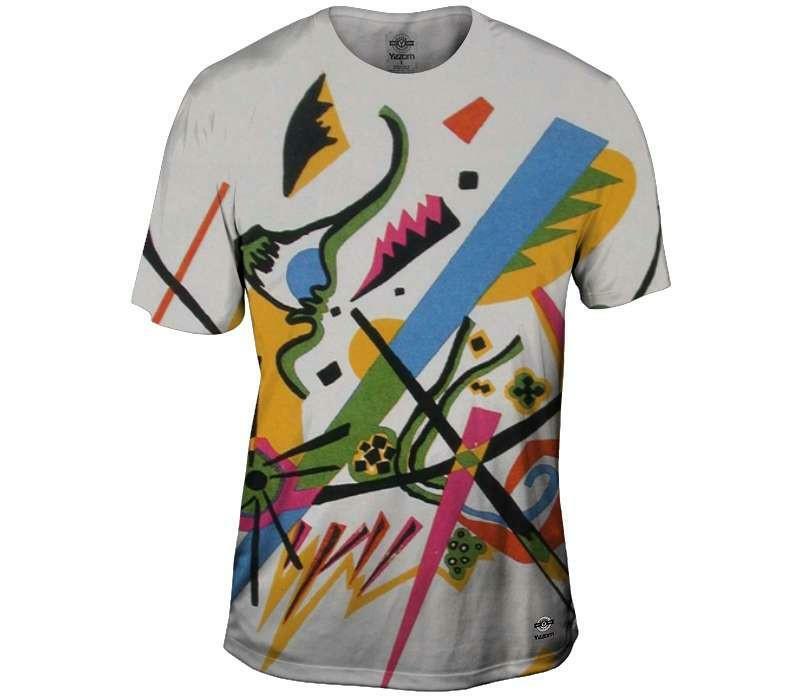 This print also makes for an unconventional, yet fashion forward look. 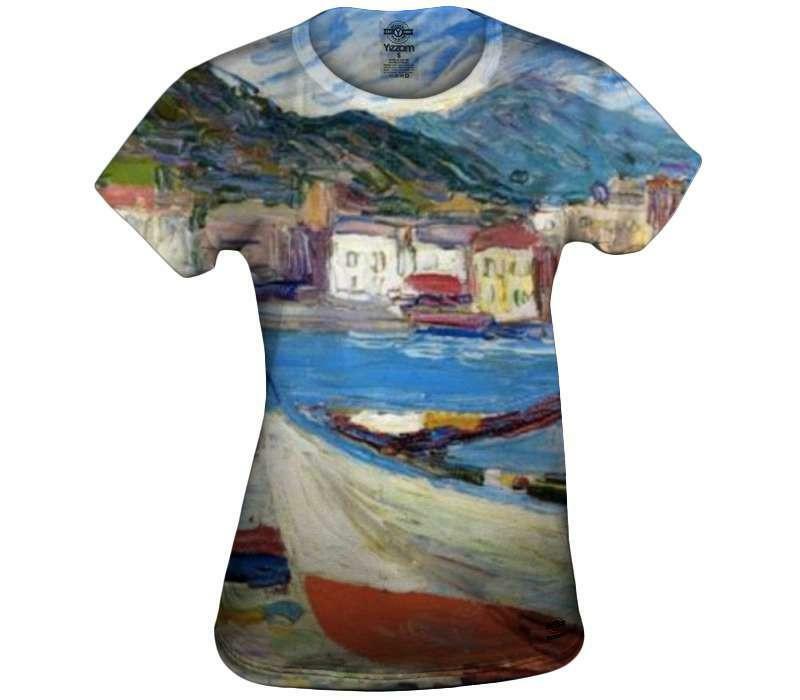 It is also available in a Mens T-shirt. A four part piece, this portfolio of work includes four prints in etching, woodcut, and lithography. Each print is representative of Kandinsky’s view of the world as a self-contained cosmic entity consisting of incalculable independent, enclosed units. But, you know, we just think it makes for a really cool t-shirt. Completed in 1944, the year of Kandinsky’s death, some see this painting as full of sadness, depression and pain. Others see this picture as a homage to a life fulfilled. 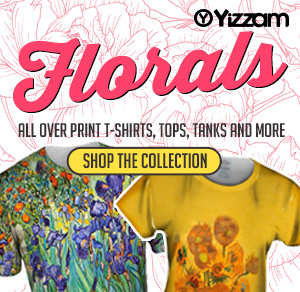 However you see it, one things for sure, the print is a stylish wardrobe must-have. This top is also available for men. Another example of Kandinsky’s love of painting landscapes and water, this piece was originally done with oil on canvas. Less abstract and with geometric than his other paintings, this painting is still one of Kandinsky’s most popular ones. Full of emotion and harmony, it’s no wonder that this top can be dressed up or down for that perfect look. 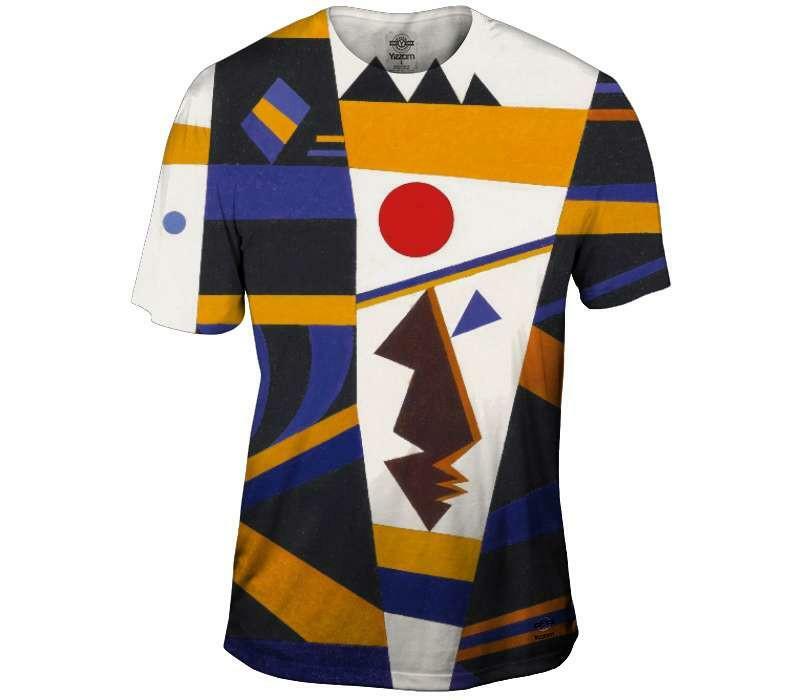 This top is also available for men.